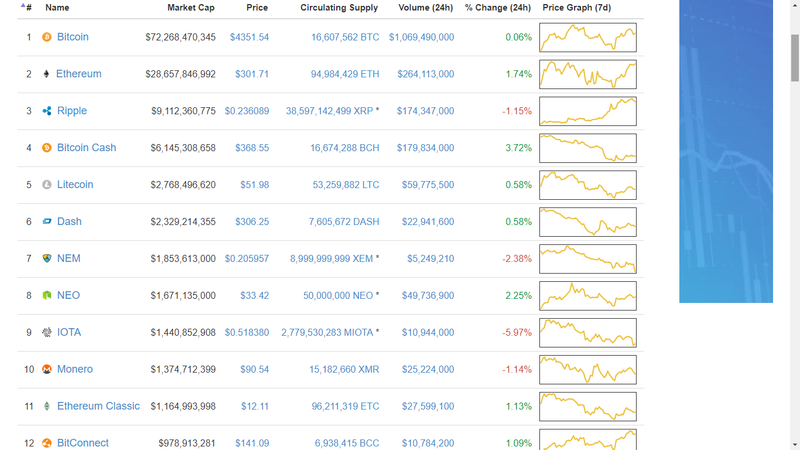 How market cap has behaved this week? Overall the market has been progressing, even though bitcoin price did not get to or over $3500. At the same time we saw an increase in the total amount invested in the market and many coins changed their rangs and we saw a few new coins in the first 20 list of the market. Some of the reasons for the price range could be the bitcoin gold and Segwit2x forks which are due in October and November and also news from China, South Korea and Japon. Today we have heared from Bitfinex that is going to accept Segwit2x and it will give away the same amount of coins as their investors have in their account. But there is no news from other exchanges and we have to wait and see but one thing for sure, I don't think any of them has forgoten the coinbase experience with bitcoin cash. investors are also participating in many other coins which in the short term are gaining profit mean while waiting to see what happens with the major coins. Hostilations in some of the coin prices have been reduce, such as Neo, Ethereum and only this week has increased in dash. Japan has officially shown interest in mining and there are some companies which are going to make a special chip only for mining which is going to be more cost efective than the existing ones. Over all the market is growing within its price range and the total investment is increasing slowly and the users and investors are investing in other coins. At the same time with so many existing coin in market cap, each week we are hearing about a new ICO. Conculsion: This shows the possibilities that the cryptomarket can offer and I believe is only the beginning. "...though bitcoin price did not get to or over $3500..."
Life is either a daring adventure or nothing. Hope you have a great day!